Can Pat Shanahan Serve as ‘Acting’ Defense Secretary Forever? Those reports, which emerged late last week, are “erroneous,” Shanahan told the Senate Armed Forces Committee in his first appearance before Congress as the acting head of the Pentagon. President Trump has long publicly complained about the expense of basing U.S. troops overseas and has insisted repeatedly that allies contribute more towards the hosting them. In February, Washington and Seoul struck an agreement increasing South Korea’s share of maintaining the 28,500 troops on the peninsula by almost 10 percent — far short of what Trump had asked for, but resolving fears, at least for a year, that he would unilaterally order their removal. Shanahan’s quick denial allowed him to sidestep what otherwise might have become a contentious line of questioning in his first major appearance on the Hill, where lawmakers have been broadly alarmed by Trump’s unusually critical rhetoric of multilateral U.S. alliances overseas. 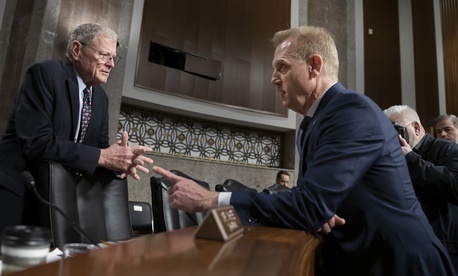 He gave a relatively even performance during just over two hours of questioning, often deferring to Joint Chiefs chairman Joseph Dunford and Pentagon comptroller and acting deputy defense secretary David Norquist. Still, Shanahan did not escape unscathed. Democrats hammered him repeatedly over the use of military construction funds tucked away in a contingency funding account to pay for Trump’s wall on the southern border. Shanahan testified that it was “correct” that the Pentagon had not yet assessed which projects would be deferred until the following year to free up funds. “Why is that correct? You've had a month. Are you testifying that there's no information you can give us about which construction projects are on the chopping block?” snapped the typically genial Sen. Angus King, I-Maine. Later, Sen. Tim Kaine, D-Va., said that he felt “completely sandbagged” by the Pentagon, accusing it of withholding information about what projects could be deferred to pay for the wall. "There has not been a deliberate attempt to withhold any information," Shanahan told lawmakers.